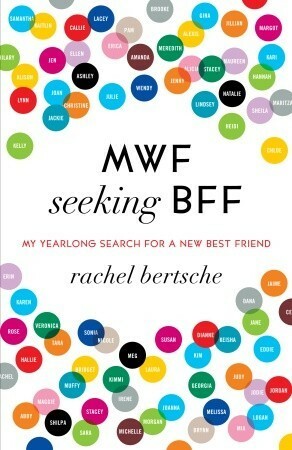 In her thought-provoking, uproarious memoir, Bertsche blends the story of her girl-dates (whom she meets everywhere from improv class to friend rental websites) with the latest social research to examine how difficult—and hilariously awkward—it is to make new friends as an adult. In a time when women will happily announce they need a man but are embarrassed to admit they need a BFF, Bertsche uncovers the reality that no matter how great your love life is, you’ve gotta have friends. What do you do when you are friendless in an unfamiliar big city? You put out an ad for friends, of course! The author moved to the Windy City after marrying her college sweetheart, from that statement alone everything sounds hunky-dory...however, she had to leave behind her two best friends. Rachel's story is hysterical. This book will easily make the reader laugh, experience several awkward moments with Rachel, and hold his/her breath to see if the friendship will work out. The way the author writes will captivate the reader. Rachel's style of writing is fluid, down-to-earth, and infused with humor. Rachel literally holds nothing back, she is very candid with the reader. The potential candidates for Rachel's BFF are fun to get to meet. They each have different qualities and mannerisms that will make them stick out to the reader. The reader will also be able to follow Rachel's reasoning and logic for why a friendship didn't work out or may work out. It's funny to think of speed-dating for friendship, but Rachel will help the reader see the merit in it. 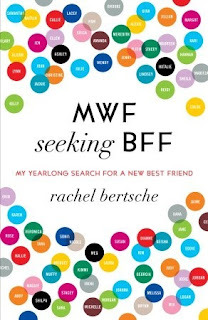 One statement of Rachel's that sticks out as a pearl of wisdom is when she states that society has made it acceptable to be a woman seeking a man and vice versa, but not a woman seeking friendship from other women. She also goes into detail about how female friendships are taking a hit in recent years, this information should be interesting to readers-particularly readers of the female persuasion. Overall, this book was hilarious and absorbing, highly recommended to adult/young adult readers.